Brian K. Vaughan and Adrian Alphona’s Runaways is arguably one of the most influential superhero comic books of the 21st century, introducing a diverse cast of brand new characters and sustaining their survival in stories that were almost completely separated from the larger Marvel universe. It had the energy and imagination of a creator-owned book within the confines of a corporate-owned comics universe, and it lasted for 42 issues under that original creative team, proving that it was possible for writers and artists to come up with something new that could succeed in a crowded superhero marketplace. Runaways was so popular that Joss Whedon was named Vaughan’s successor on the series, a move that ended up hurting the book more than helping it because of lengthy delays between issues. A disappointing run by writer Terry Moore on the title’s third volume would be the death knell for the team’s ongoing adventures, but the spirit of Vaughan and Alphona’s original run lives on in Avengers Undercover. A sequel to the controversial Avengers Arena (and featuring that title’s creative team), the All-New Marvel Now series began with a group of the Arena victims teaming up to hunt down Arcade, finding themselves new recruits to Baron Zemo’s Masters Of Evil after one of their own kills their red-haired former captor. (This week’s cliffhanger adds a new wrinkle to that twist.) The new status quo has given the creative team the opportunity to explore the appeal of a criminal life for young heroes, a theme that works especially well for the two Runaways in the cast, who initially fled from home because they learned their parents were supervillains. Nico Minoru was on the right path until she was abducted and forced to fight for her life in an arena full of other unwilling participants, an experience that left her traumatized and unsure of what to do with her power. Nico and her friends have decided to infiltrate the Masters Of Evil with the intention of taking it down from the inside, but the more time they spend on the dark side, the harder it becomes to repel its attraction. To heighten the appeal, Nico’s ex-boyfriend Alex Wilder has been resurrected from the dead (a development set up in the final pages of Vaughan’s Runaways) to help her understand her enhanced magical abilities and teach her battle strategy. His influence, combined with her overwhelming frustration with herself and the world, pushes Nico over the edge in Avengers Undercover #7. Giving Nico a Hellboy-esque Left Hand Of Doom after her revival in Murderworld was a clever design choice that reflected the personal sacrifice she was making to survive in the arena; this new appendage is rich with magical power, but power leads to corruption if it isn’t kept in check. With her new position as an aspiring Master Of Evil, Nico is expected to use all of her potential, but her undercover responsibilities and established moral foundation force her to put restrictions on herself. At the core of all this is Nico’s relationship with her parents, two evil wizards who wanted to end the world so their daughter could live in paradise. She made a promise to herself not to follow in their footsteps, the kind of promise people make when looking at the world through the naive lens of adolescence, and it shatters under the weight of her new circumstances. I’ve always tried so hard to do the right thing. Even when it smashed my life to pieces. Even when it took my parents away. I tried to be good. But what the hell’s the point? Being good keeps turning out wrong. I keep hurting all the people I love. So forget it. Just this once. Just for a while. I’m gonna do the wrong thing. The stupid bad thing. And I’m gonna like it. When Nico kisses Alex, she starts running again. She’s running from a disappointing life of following the rules to embrace the full breadth of life without fear of consequences, getting high off the thrill of being a bad girl. The journey to Nico and Alex’s kiss has been masterfully plotted by Hopeless, who clearly has an appreciation for the work done by the character’s creators, and the shifts in Nico’s character have been captured in Kev Walker’s artwork every step of the way. Avengers Undercover #7 marks Walker’s final issue on the series, and he gets a deeply reverent send-off in the letters column, which includes words from the book’s writer, colorist, editor, and publisher thanking the artist for everything he brought to this title. Which is fully justified, as his contributions have been essential. In Avengers Arena, Walker and his inker Jason Gorder helped sell a hard-to-swallow concept by capturing the emotional impact of Arcade’s Murderworld on a young, vulnerable cast, emphasizing character development while delivering spectacular action that maintained a delicate balance of superhero fun and horrific violence. In Undercover, he’s shifted the balance to the fun side, making the supervillain lifestyle as appealing to the reader as it is to the characters. Beaulieu’s contributions to the two titles have been equally valuable. After taking over coloring duties from Frank Martin on Avengers Arena, he immediately established a distinct style while staying consistent with the evocative work done by his predecessor, pushing more vibrant, almost neon colors that heightened the fantasy element. More realistic coloring would have made Arena and Undercover far too dreary, especially during the brutal moments when Walker’s linework gets very gritty, so using a brighter, more varied palette helps lighten the tone. That doesn’t mean a loss in atmosphere, though, and Beaulieu is able to convey a huge range of moods within those vivid shades, a skill he honed while working on Marvel’s Oz adaptations with Eric Shanower and Skottie Young. Avengers Undercover #7 is a story about individual potential, moral responsibility, and extraordinary power that has the emotion and energy of those early Runaways issues. For fans of Vaughan and Alphona’s series, it’s the kind of story that seemed unlikely after the characters more-or-less disappeared from the Marvel universe, and while Avengers Arena required the sacrifice of some teen heroes to keep others out of limbo, it’s given the surviving cast members a higher profile, which can only mean good things for their futures after Avengers Undercover. And that future is quickly approaching. This series ends with September’s #10, which means there’s a lot of ground for the creative team to cover in three issues. 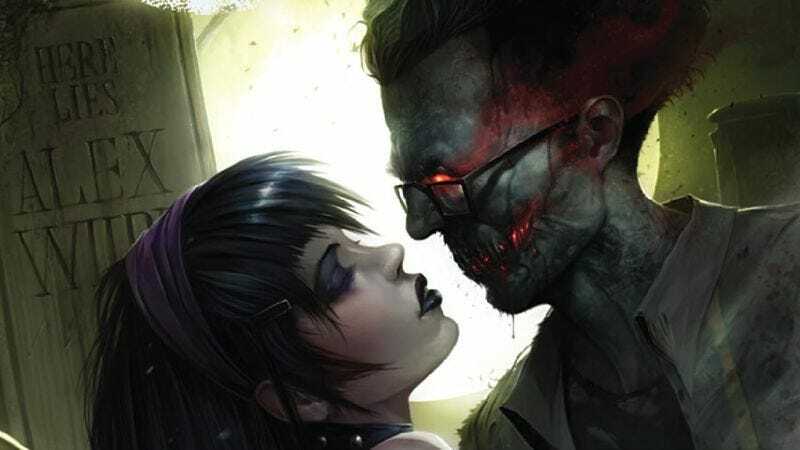 It’s the conclusion that Hopeless has had planned since the beginning, but it’s coming a few issues earlier than expected, which isn’t a bad compromise when it comes to superhero comics. Hopeless had a 28-issue run on two series that pulled a lot of great characters off the sidelines while expanding the world of Marvel’s teen heroes, and he got readers passionate about the books in the process. Ideally, Marvel will find something to do with these characters, because they have more narrative potential than ever. Now that these heroes have dabbled with the supervillain lifestyle, they’re going to have a difficult time going back to the lives they had before. Sounds like the perfect time to run away.